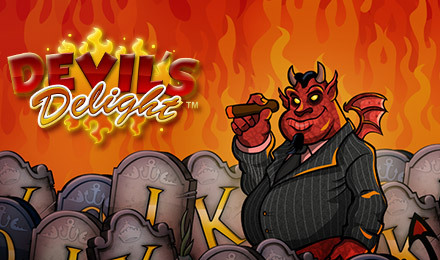 Embrace your inner sinner and spin to win in Devil's Delight Slots! FREE spins. Multiplied wins. 5 reels & 20 Paylines. Play today! Devil's Delight Slots is one of the most popular 5 reel 20 payline online video slot games around! Whether you're naughty or nice, you're bound to love Devil's Delight and to win big in this 5 reel, 20 payline game with amazing sounds and graphics. Activate 3 or more Scatters to win FREE spins! Whilst you're playing in the Free Spins Round, spin 2 or more Scatter symbols and you will win even more FREE spins or multiplied wins! Loads of rewarding features and loads of chances to win!